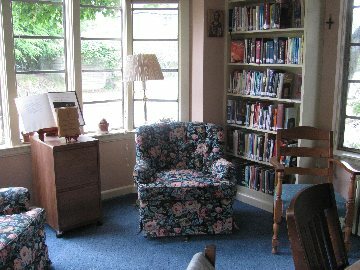 The Library Committee maintains St. John’s Church Library. The library includes both an adult section and a children’s library. The Library Committee keeps an inventory of books, purchases new and used books and discards older books. The Committee also checks in returned books and creates cards for new books. The Library Committee manages the sale of donated books at both the Christmas Faire and the June Jumble. The budget for buying new books comes from these two sales. New library volunteers are always needed. For information, contact Janice Jackson or Dianne Russell through the church office, 352-8527.